Yes, that would be annoying to be re-directed to a mobile site on your iPad. Total traffic sources may also increase as the choices available to access sites increases. Expect more visits from OS/browser sources as obscure as Playstation & playstation portable, opera mini & Wii. The key will be understanding the intelligence & how it's responded to. – Are they new/returning visitors? – What's the conversion rate? Eric, you are of course right. We need to "expect more visits from OS/browser sources as obscure as Playstation, playstation portable, opera mini and even Wii." Right now I it might be too soon to really get any true perspective of different habits as shoppers are visiting our dealer websites on these new OS/browsers, due to the low volume by in itself. I can't speak for others, but I find myself a little more click happy when "exploring" sites on new (non mobile) browsers – but that might just be me . Especially the ipad – I love to read and surf the web the ipad. I "think" if a site is optimized right, we'll see a lift in overall conversion from mobile devices. Especially if your phone numbers are placed in optimal areas throughout our website and are quicklinked allowing the browser to place the call right from page they are on. One thing to consider; when you get the opportunity – browse your websites on the different browsers. We dealers need to be sure our dealer websites are cross browser compatible. Flash websites are of course not going to show up on iphone/Mac mobile OS. So if you have one of those Flash intensive websites – you may as well forget about your dealer website rendering correctly on the iphone or ipad. Something to possibly consider in the near future. One of my websites has a homepage flash element – I'll be getting with this vendor very soon on an alternative solution. It's going to fun watching where this goes and how much this conversation will change over the next few years. @Jeff – For sure, too soon for the data to suggest any real trend…at this point, it should at least be on someone's radar if they're involved w/managing a website. I have noticed one goal conversion on our site blow up overnight, from the iPad user's experience – hoping for a significant behavior change w/this one metric as it could help identify a significant shift in our retail strategy. Great questions Eric. Everyone should have the answers to every single one of those questions. If you don't, reply and let me know why… do you not know where to start? 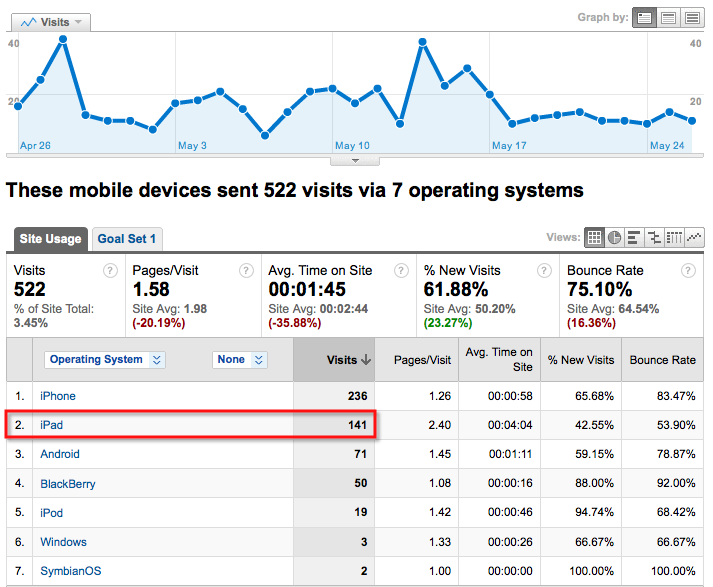 Your mobile traffic should at least convert the same as the full blown site (as I have seen for my stores). Mobile is overestimated in many areas and underestimated in others… no, I'm not a politician.